This enhancement used to control the GR/IR account ( clearing account between goods receipt and invoice receipt, You’ve known the GR/IR clearing account is posted to purchase order upon goods receipt and is again credited at a later point when posting the incoming invoice. You may want to use different GR/IR account due to specific dependencies, for example you want to manage custom GR/IR account for each o your purchasing organization to created differentiated evaluations. You can do this with the enhancement LMR1M002. First you have to configure Account determination via SPRO . Material Management -> Valuation and Account Assignment -> Account Determination -> Account Determination Without Wizard . and select Specify Account Determination ( MM ). Scroll until you find transaction WRX then double click on it. click on button toolbar Rules, and select General Modification and save this change. The purchase number ( I_WRXMOD-EBELN ) and the purchase order item ( I_WRXMOD-EBELP ) are transferred to the user exit EXIT_SAPLKONT_011 you can use those parameter to read purchase order data, then you can determine the account depending purchase order data and then transfer to the output parameter E_KONTO_MODIF. 1.Go to tcode CMOD then create the project for example ZMR1M002. 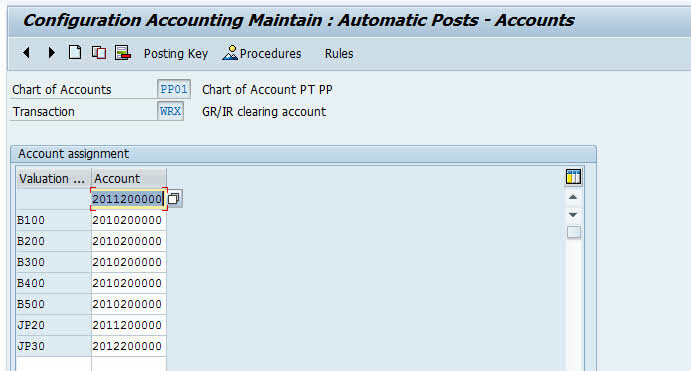 3.Switch to the components and navigate to the user exit EXIT_SAPLKONT_011. This is Sample ABAP Code for this user exit. *------------------------------------------------------------* * INCLUDE ZXM08U18 *------------------------------------------------------------* *”*”Local interface: *” IMPORTING *” VALUE(I_WRXMOD) LIKE WRXMOD STRUCTURE WRXMOD *” EXPORTING142 6 User Exits and BAdIs in the Valuation and Account Assignment Area *” VALUE(E_KONTO_MODIF) LIKE T030-KOMOK *------------------------------------------------------------* * Data collection to obtain data of purchase order: DATA: ls_ekko TYPE ekko, ls_ekpo TYPE ekpo, ls_ekpa TYPE ekpa, lt_konv TYPE TABLE OF konv, ls_konv TYPE konv. * Read purchase order header SELECT SINGLE * FROM ekko INTO ls_ekko WHERE ebeln = i_wrxmod-ebeln. * Read purchase order item SELECT SINGLE * FROM ekpo INTO ls_ekpo WHERE ebeln = i_wrxmod-ebeln AND ebelp = i_wrxmod-ebelp. CASE ls_ekko-ekorg. WHEN ‘0001’. e_konto_modif = ‘999’. WHEN ‘1000’. e_konto_modif = 'ASN'. ENDCASE.